Cospheric offers polymer microspheres with specific gravity of 1g/cc are specifically designed to match the density of water for optimal suspension of particles. Suspension of microspheres in water enables the visualization and characterization of fluid flow and testing the capability of devices to withstand particulate matter in the fluid stream, ensuring that microspheres do not settle and do not float on the surface. Most of these polymer microspheres are at least moderately opaque and clearly visible in water, clear or translucent liquids. Many Colors are available in sizes from 10um up to 1180um, of polyethylene microspheres are available with specific density of 1g/cc, designed for optimum suspension in water for fluid flow visualization. Colors include Violet, Orange, Yellow, Fluorescent, Grey, Pink, Blue, and many fluorescent colors. 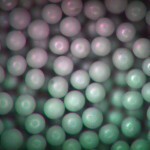 Microspheres are round microparticles that typically range from 1 to 1000 μm in diameter. In the pharmaceutical and cosmetics industry, microspheres are well known for their ability to deliver active materials. 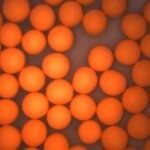 This process usually involves the microencapsulation of a drug or an active cosmetic ingredient to protect it from the deteriorating effects of the environment or for optimal release and performance in the final product. Active ingredients are released by dissolution of the capsule walls, mechanical rupture (rubbing, pressure, or impact), melting, or digestion processes. Solid microspheres are widely used as fillers and spacers in a variety of industries. Microspheres used to manufacture and test medical devices are typically solid particles that are made from robust and stable raw materials such as polymers, glass, and in some cases, ceramics. 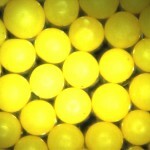 Different types and grades of microspheres are available and selected based on specific application requirements. 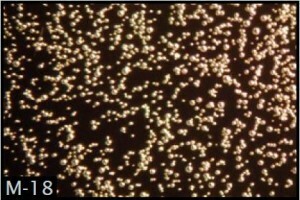 They are often used as tracers and challenge particles in medical devices. In these situations, it is beneficial to use larger microspheres with sphere diameters greater than 50 μm that are vividly colored (red, blue, black, yellow, or green), since they provide contrast with the background material and visibility to the naked eye in daylight. Colored microspheres are typically used in the testing of filtration media and systems, vial and container cleaning evaluations, flow tracing and fluid mechanics, centrifugation and sedimentation processes, pharmaceutical manufacturing, and contamination control. Fluorescent microspheres are recommended for applications that require the use of particles that emit distinctive colors when illuminated by UV light and offer additional sensitivity for observation through the use of microscopes, lasers, and other analytical methods. Examples include microcirculation and biological research, imaging, and flow cytometry. Fluorescent microspheres can be excited and detected by a wide range of methods and are useful as experimental particles for acoustical and optical analytical systems. 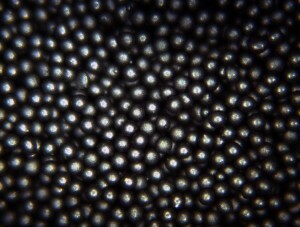 Recently black paramagnetic microspheres have been produced in larger sizes of 10 micron to 1mm (1000um) and in dry form enabling scientists to leverage the benefits of paramagnetic particles in new applications. These highly spherical polyethylene microspheres offer the flow-ability of standard microspheres, with the ability to be separated from other materials for re-use and cleanup. 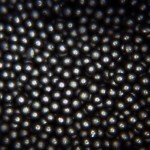 One use of paramagnetic microspheres as large as 1mm in diameter to simulate salmon eggs, Scientists are able to place them in a natural habitat, observe how they move with the water currents and then use their magnetic properties to clean them up. 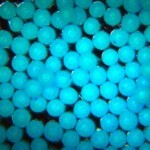 Super paramagnetic microspheres used in the life science industry are supplied in solution form. From early days engineers have been looking for ways to shield circuits from electromagnetic interference (EMI). One of the most effective methods of shielding is by creating an electrically conductive enclosure around the circuit or device. This can be accomplished by using any electrically conductive material. Advances in coated microspheres have enabled the creation of light weight electrically conductive coatings that provide excellent EMI shielding. Electrically conductive microspheres are produced by applying a metallic silver coating to the surface of the microspheres, thus giving the advantages of a metal particle with the additional properties of the core microsphere. Typically hollow glass microspheres are silver coated as this offers the combination of a low density filler and a conductive particle. Coatings with EMI shielding of greater than 45db have been produced by adding as little as 20% by weight of M-18 silver coated microspheres.